Yes, I know Christmas is over. 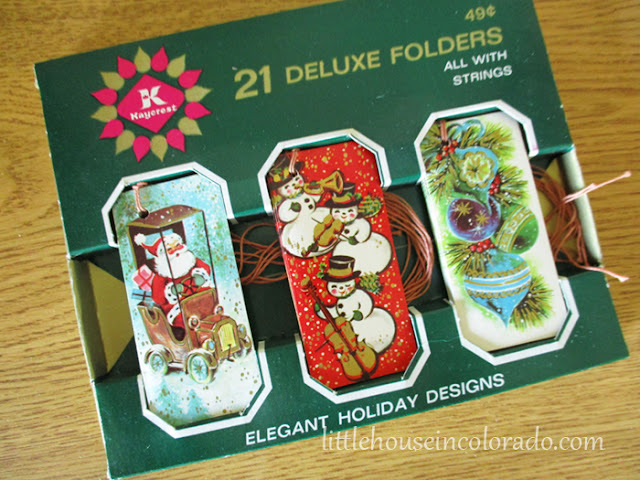 But I just had to post about this adorable set of Christmas gift tags I found! I just about squealed when I spotted them! 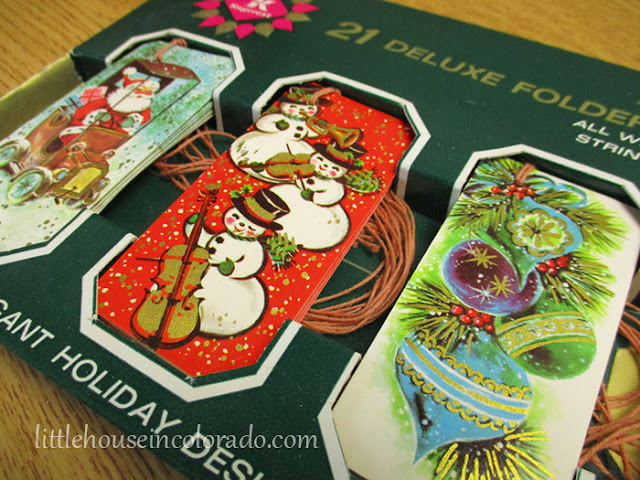 These gift tags are still in the original retail box. They were made by The Papercraft Corporation and have the Kaycrest brand on them. The box originally held 21 tags and it looks like there are still 18 left. The tags fold over so you can write your sentiment inside. Strings are included for attaching to gifts. The back of the box is just as interesting as the front. 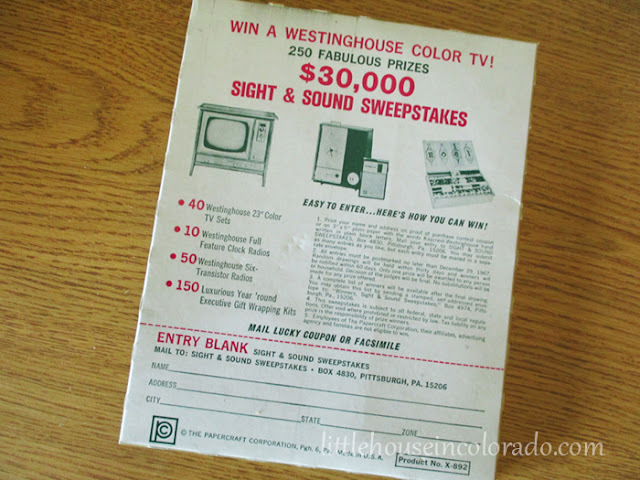 It has an entry coupon to a long-ago ended contest with prizes ranging from "luxurious gift wrapping kits" to Westinghouse transistor radios and 23" color tvs! 23" COLOR televisions! What would they think of us now? We've come a long way! 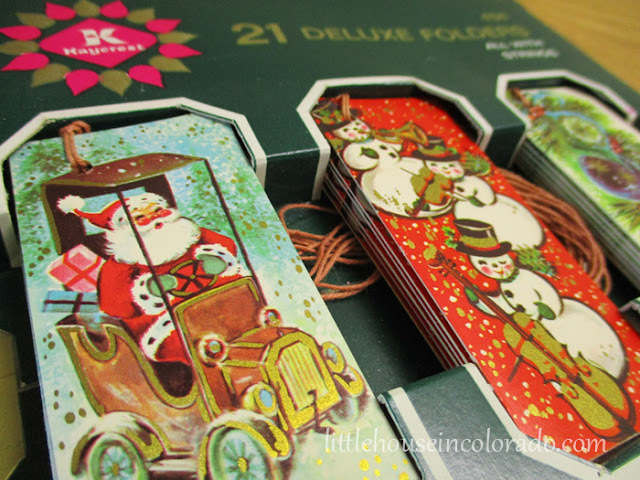 These gift tags are in great vintage condition, having been stored in their original box. The box itself has very little shelf wear considering its age. We are estimating these gift tags to be circa 1960s. Perhaps even late 1950s. They would be the perfect final touch for those extra special presents. Or use these as labels in scrapbooks or in other paper crafts. You can pick these gift tags up in our Etsy shop right now so you'll have them for next Christmas!